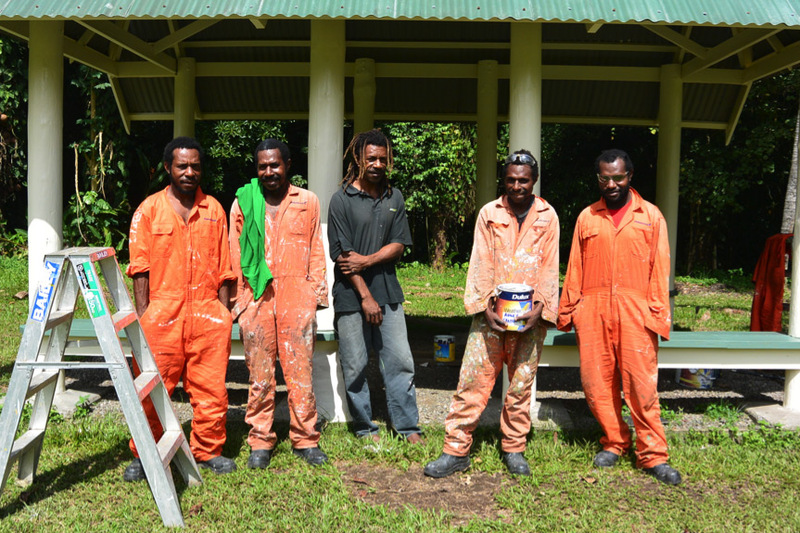 Lae, Morobe Province, PNG, 26th November, 2015 â€“ Dulux Group PNG is the latest Lae business house to commit significant support to the Lae National Botanic Gardens Advancement Program, pledging ongoing support in the form of cleaning and re-painting many of the structures placed throughout the gardens. With work already commenced, the difference is obvious; you may have glimpsed picnic shelters as you drive past the gardens, shining like new after a team of five Dulux painters have been hard at it, cleaning and giving them a fresh coat of paint. Dulux will be continuing their work in the gardens and are interested in being a long-term partner of the Lae National Botanic Gardens Advancement Program. They will be giving most structures a good clean and fresh coat of paint including two more picnic shelters, the gate shelter and guardhouse at the Milford Haven Road entrance and the roof and brickwork of the newly repaired toilet block. They will also be providing paint and labour to repaint the newly washed down RAAF DC-3 plane which will be coordinated in partnership with the RAAF DC-3 Steering Committee. Much of this work was completed prior to the Gardens Open Day on Friday 6th November with some scheduled in the coming weeks. About Dulux Group: DuluxGroupâ€™s PNG headquarters are in Lae, where it has manufactured paint and chemicals for over 40 years. It employs about 100 people between Lae and Port Moresby, and has trade depots in Kimbe, Kokopo and Madang. Seventy percent of DuluxGroupâ€™s coatings products are made in PNG. Above: The Dulux team of painters hard at work re-painting a picnic shelter in the gardens. 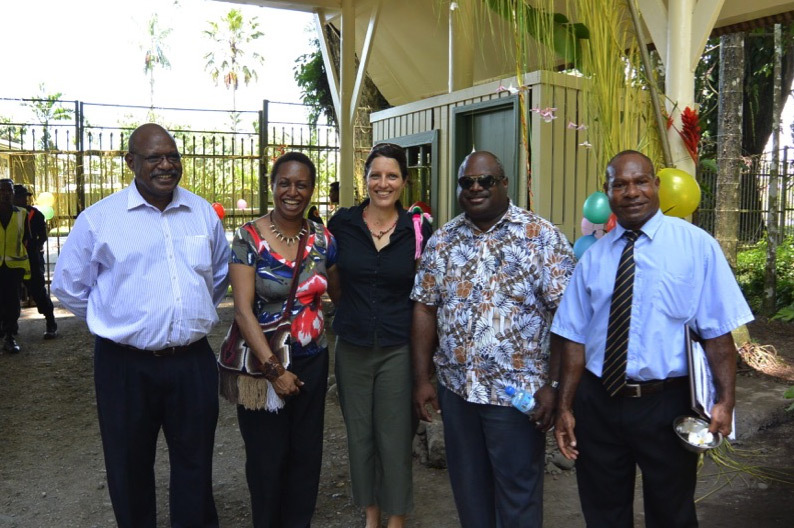 Lae, Morobe Province, PNG, 6th November, 2015 – After being closed to the public for over a decade, with a great deal of satisfaction and appreciation for all involved, the gates of the Lae National Botanic Gardens were officially re-opened to the public on Friday by the Hon Loujaya Kouza MP. 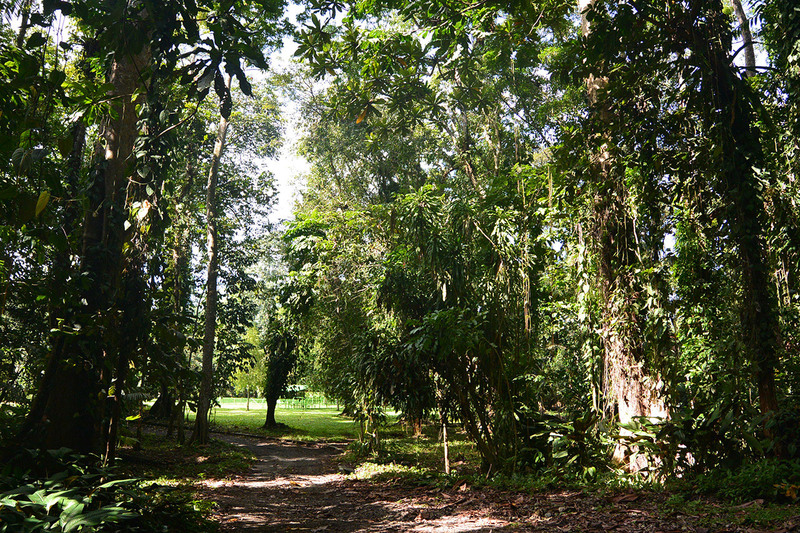 After eight months of combined efforts to revive the gardens under the Lae National Botanic Gardens Advancement Program, on Friday 6th November, 2015, PNGs Forest Research Institute, the Friends of the Lae Botanic Gardens and many generous business houses united to celebrate this moment whereby the gardens were reopened and viewed by many excited stakeholders, media and members of the public. This day marked a key milestone of the Advancement Program and the Lae Botanic Gardens Master Plan. It was a day to celebrate and thank those involved for their efforts, showcase the much-improved gardens and to appreciate the 24 business houses that together, have contributed more than 500,000 Kina of equipment, labour, expertise and machinery hire towards the Program since it began. It is a true testament to what can be achieved when a community bands together for the good of the Region. The community now has ongoing access to one of its’ most important and valued assets again. Speeches were followed by a ceremony whereby Certificates of Appreciation were awarded to program leaders including PNG FRIâ€™s Michael Lovave and Friends of the Lae Botanic Gardensâ€™ Sarah Warne and Mia Cusack, and the 24 business houses who had contributed to essential Program needs – from the supply of essential infrastructure to enhancing the capacity of the Grounds People to sustain the operations of the Botanic Gardens. Guests were then escorted on a walking tour through the gardens to the southern precinct while viewing all the newly revived areas and infrastructure. Nearby the newly cleaned RAAF DC-3 plane, a ribbon cutting ceremony took place to officially open the Gardens to the public. The Rotary Club of Lae, Andersons Foodland and Gala Ice Cream provided lunch and refreshments and from 1-4pm the gates were also open to any members of the public wishing to view the gardens. Dr. Martin Golman, Acting Director of the PNG Forest Research Institute was thrilled with the event stating, words can’t do justice to what you see here today at the Gardens, the efforts of so many people, and the generosity of so many businesses in Lae, the hard work and determination of the people and organisations driving the National Botanic Gardens Advancement Program, friends, media, advocates and interested public. All of you have made this day possible in some way and the Forest Research Institute and the people of Lae are indebted to you all for your support. There is a bright future ahead for these gardens as a place of education, research and recreation which was made possible by this community, for this community, we can’t thank you enough. The PNG Forest Authority and Friends of the Lae Botanic Gardens would like to thank all sponsors who have contributed to the Lae National Botanic Advancement Program to get to this point. For ongoing logistical and communications support: Swire Shipping, Lae Chamber of Commerce and The PNG University of Technology. For the innovative designs of five conceptual gardens for the Northern Precinct: Swire Shipping and Garden City Design Co.
For infrastructure development within the gardens: Dekenai Constructions, Northbuild PNG, Dulux Group, PNG Forest Products and Consort Express. For capacity enhancement: Bishops, Brian Bell Homecentres, Boroko Motors, Ela Motors, Farmset Limited, Hila Holdings, Lae Builders and KK Kingston. For hands on participation in the gardens: Nestle and Laga Industries. For communications and signage support: Lae Chamber of Commerce, CTL Signs and Rob McIntyre Web Design. For event support: Rotary Club of Lae and Andersons Foodland. The National Botanic Gardens Advancement Program is far from over, and is always looking for more sponsors, volunteers and interested organisations to assist in bringing these gardens back to life. If you would like to get involved, please contact Michael Lovave on email: mlovave@fri.pngfa.gov.pg or phone: 472 1041 or 472 4188. 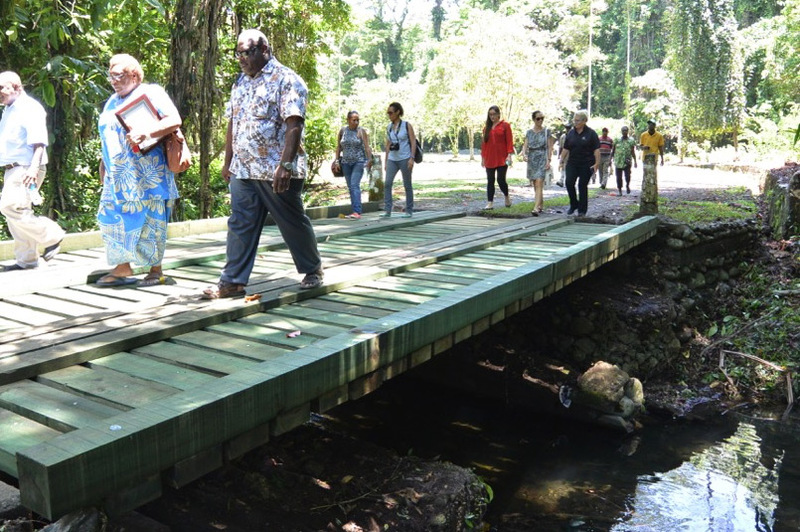 Above: Guests take a tour through the gardens, seen here walking over the newly built bridge with materials donated by PNG Forest Products and Swire Shipping and construction undertaken by Dekenai Constructions. Above: After the cutting of the ribbon to open the gardens. From L-R: Dr. Martin Golman (FRI), Loujaya Kouza (Lae MP), Tunou Sabuin (PNG Forest Authority), Gardens Curator Michael Lovave (FRI).